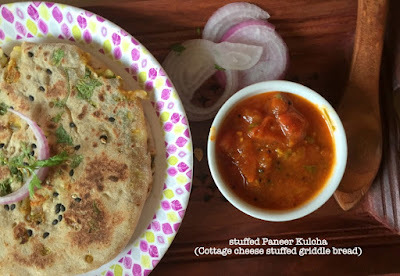 Paneer (Cottage Cheese) is a favourite with the elder kid, and we make Paneer based dishes often at home.. Kulcha (or leavened flatbreads either baked or mostly fried on griddles) are another favourite at home. 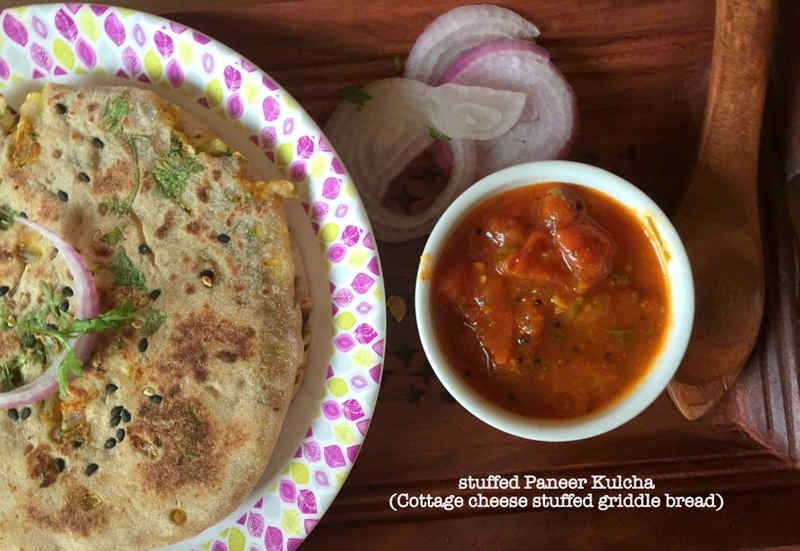 I combined the two and made these fluffy, pillow soft and healthy Wholewheat Paneer kulchas at home. Can be paired with most North Indian Gravy dishes, but best known paired with Amritsar Chole / Black Channa / Chickpeas Gravy. We made this for a Sunday Brunch with vegan Tomato Chutney and these mini Kulchas were relished by all. Makes a wholesome meal. Prep time : 15 mins + rise time (2 - 10 hours / overnight if preferred). In a stand mixer or large bowl add all ingredients except oil and make a soft dough (it took 8-9 mins in my stand mixer). Depending on the quality of the flour, you may need more or less 1/3 cup water. Add oil and knead for further 2-3 min on a countertop. Place in a greased bowl for minimum 2 hours (or refrigerate overnight if using the next day). Next day or after 2-3 hours (if using the same day), punch down the dough. Divide into 6-7 equal portions and make it into round balls. Rest them in the same bowl under a muslin cloth / kitchen towel. For the stuffing : Mix the crumbled / grated paneer (cottage cheese).. Add the finely minced onion, seasonings and mix well and keep aside. øn a lightly floured surface, roll out a portion of the dough into a 7-8 cm disc, place 1-2 Tbsp of the filling and wrap this up and seal the top (as shown). Gently, roll into a thickish disc (as I was making mini Kulchas, I didn’t roll out very flat discs). 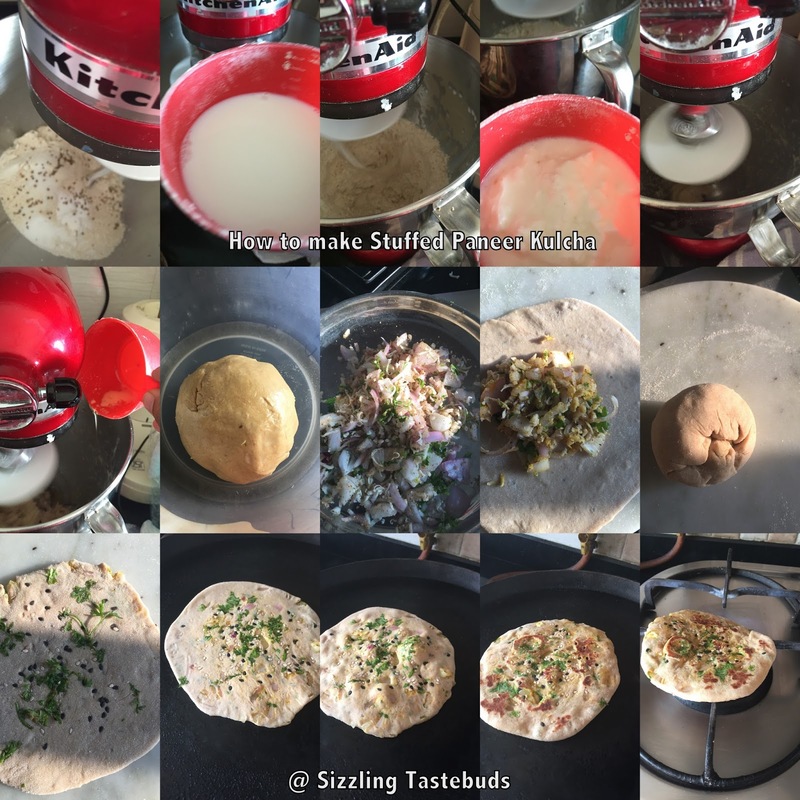 gently press in a portion of the topping onto the rolled kulcha. Apply water on one side of this kulcha, place the wet side down on to a heated griddle. Let it cook on medium heat and bubbles would start appearing on the top. Now gently flip and let it brown on both sides. Quickly take it on a naked flame and let it roast for 5-10 secs (this is optional, but gives a smoky flavour). Take off flame and let it cool a bit. While still hot, brush a little butter to make it softer. Serve hot with Chole or any accompaniment. Most kulcha recipes are made from using plain flour. I love your wheat flour recipe and that too with paneer. Bookmarking this recipe to try out my kulchas at home. I love your take on the kulcha with whole wheat. thanks for joining in. I love that there is cottage cheese in this bread, one of our favorites here!! Looking good Kalyani. Would love to try your Kulcha sometime. Your Paneer Kulcha looks absolutely tender and delicious! I love the way your've pressed the herbs and seeds into it for a gorgeous presentation. These look just wonderful, and I love the savory flavors!! Beautiful presentation. 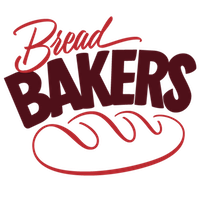 I am getting too many recipes that I want to make from all these wonderful breads! Thank you for sharing,this looks delicious. I am loving learning all of these Indian bread recipes!! Wholesome and delicious! I make them often but I love your version, will try it out soon as my son is a huge paneer lover!! There is literally No Way this bread could be anything but delicious! Love!! 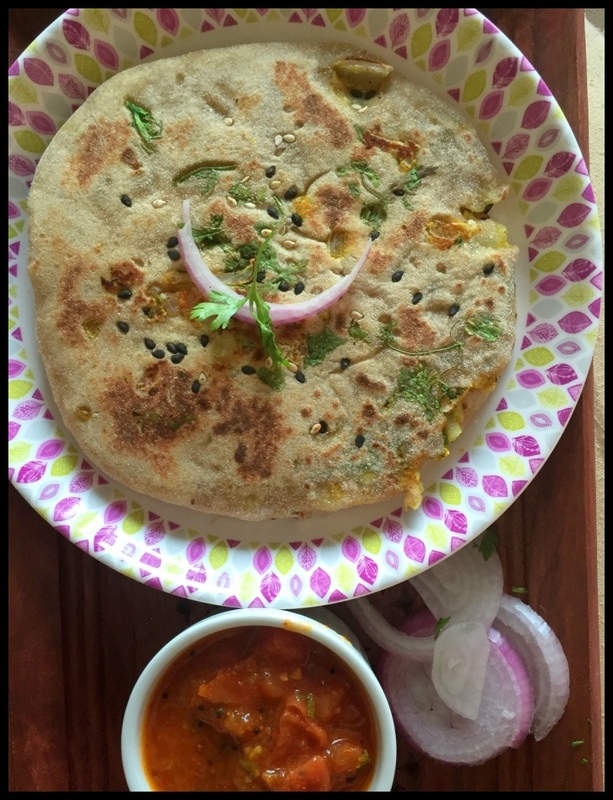 Your paneer kulcha looks amazing Kalyani. Must have tasted delicious. Love this paneer filled kulcha Kalyani. So soft & delicious. Wow with yogur . sound delicious ! !